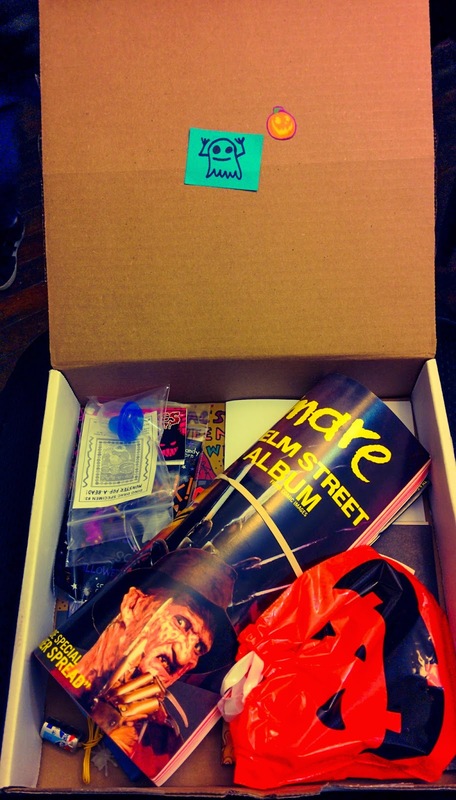 Mail Call: Dinosaur Dracula October '14 Funpack is here! Let me just start by saying that I was already super excited for my October Fun Pack, courtesy of Dinosaur Dracula, but when I heard a knock at the door a peaked the mailman standing there with a white cardboard box in his hand, I knew exactly what it was. I couldn't tear that box open fast enough. Seriously. My eyes lit up like a little kid who just got a glimpse of what's under the tree on Christmas morning. A bunch of vintage and awesomeness infused goodies stared back at me. Vintage NIGHTMARE ON ELM STREET Sticker album, plus one pack of stickers to get you started! Vintage FREDDY'S DEAD 3D glasses -- the ones handed out in theaters in 1991! A deliciously monstrous MORDLE! Everyone needs one of these little demons in their life! For the October specimen, a Madballs-esque "Pop-a-Bead" vending machine prize! A Halloween glow stick that doubles as a necklace! A small treat bag filled with a piece of candy and some other goodies! Needless to say, this fun included in this little white box should take me through Halloween. If you haven't checked out Dino Drac, you're doing yourself grave disservice -- especially if you're anything like me and get enough Halloween goodness or glorious nostalgia-ridden comas.